A U.N.-backed proposal aims to "climate proof" urban areas of the future. As glaciers melt and sea levels rise, coastal cities are looking for ways to cope with the growing threat of flooding. Seawalls are one option, and green technologies another. But one startup is making waves with its concept for urban areas designed not to resist rising water but to float on it. Illustrations of what the company calls Oceanix City show a leafy enclave built on floating concrete platforms, each covering almost five acres and moored to the seafloor in shallow waters. The platforms are linked by walkways to form cohesive communities with all the trappings of urban life, with a sustainable twist: buildings made of timber from sustainable forests; greenhouses, vertical farms and underwater gardens; renewable power sources like wind and solar; sewage and waste-recycling systems; and desalination plants to provide potable water. The floating platforms are being designed by the Center for Ocean Engineering at the Massachusetts Institute of Technology, while the above-water structures are designed by the New York and Copenhagen-based Bjarke Ingels Group of architects. Oceanix, which is incorporated in Hong Kong and headed by Collins Chen in New York, is bringing their expertise together. Collins Chen said the modular design would allow floating cities to expand to accommodate a growing population. Six of the hexagonal platforms could form a floating village big enough to hold almost 2,000 people. Six villages combined to form a floating city could accommodate 10,000. The Oceanix City concept has gained support from the United Nations, whose Human Settlements Program, or U.N.-Habitat, held a roundtable discussion on the idea at the U.N.'s New York headquarters this month. Josh Sawislak, an advisor at the Arlington, Virginia-based Center for Climate and Energy Solutions and an expert on adapting to climate change, offered a similar appraisal. The Oceanix proposal helped “show people what it could look like, and the whizz-bang-cool stuff helps people imagine this could really happen,” he told the urban future website Citylab. In any case, this isn’t the first time someone has floated such an idea. Thün said cities built on waves have long held a fascination for architects and designers. 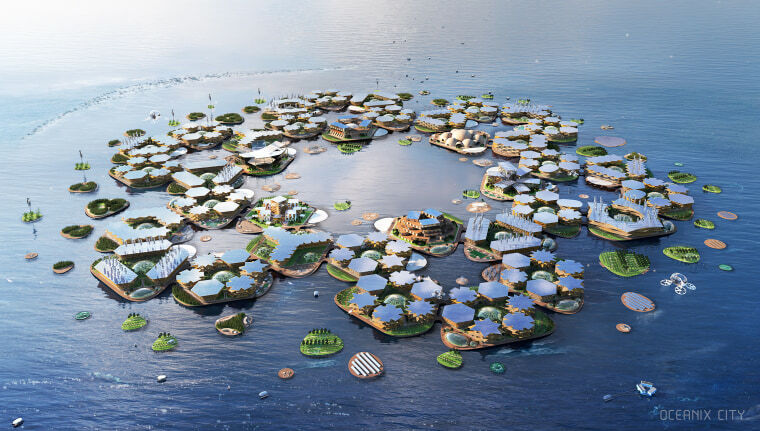 Proponents include the legendary Buckminster Fuller, who in 1967 proposed building “Triton City,” a floating home for 5,000 people anchored just offshore of Tokyo; and a Singapore-based group called Blue Frontiers that in 2017 proposed building a floating village for 300 people in Tahiti. The next step for Oceanix will be to build a prototype of its floating platforms. “We should be able to build this within months, and not years,” Collins Chen said, adding that the size and location of a prototype would be announced soon. Climate change may be dissolving the ocean floor. Here's why we should be worried.